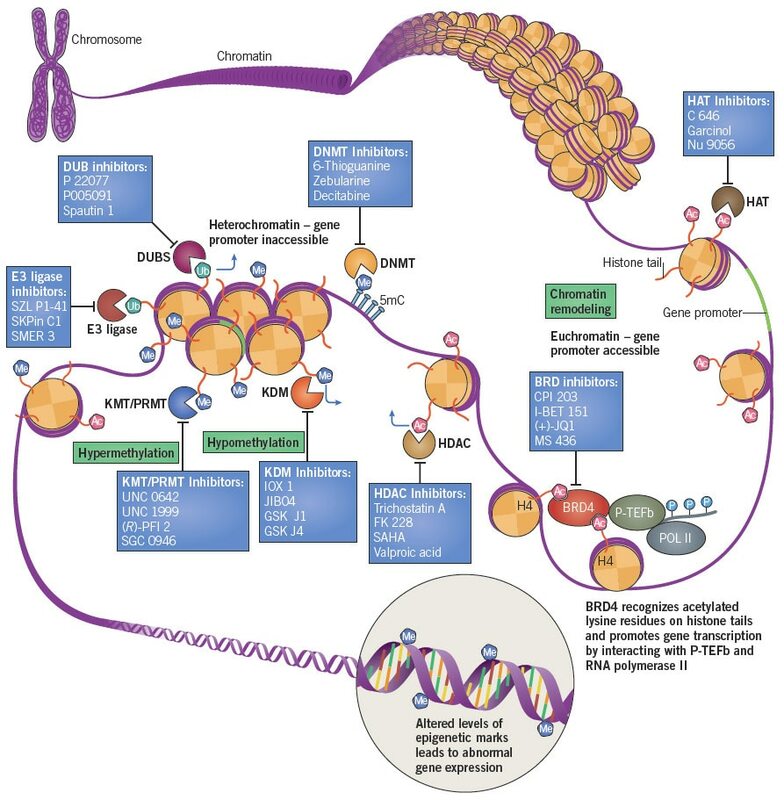 Dysregulation of epigenetic modifications has been shown to result in oncogenesis and cancer progression. Unlike genetic mutations, epigenetic alterations are considered to be reversible, and thus make a promising therapeutic target. Figure 1: The fundamental unit of chromatin is the nucleosome, which consists of an octamer of the histone proteins H2A, H2B, H3 and H4 (two of each) tightly bound by DNA. Alterations in chromatin structure by post-translational modifications can regulate gene expression through the formation of heterochromatin or euchromatin, which usually repress or activate gene transcription, respectively. Post-translational modifications include DNA methylation and the covalent methylation (Me) and acetylation (Ac) of histone tails. DNA methylation represses transcription by blocking the binding of transcription complexes to the gene promoter. The acetylation of histone tails usually loosens the DNA from around the nucleosomes, increasing the accessibility of gene promoters to transcription complexes, therefore promoting transcription. Alternatively histone tail methylation can repress or promote gene expression, depending on the site and extent of methylation, as well as the presence of other histone modifications in the vicinity. The pattern of these post-translational modifications on a nucleosome determines the transcriptional profile of nearby genes. Dysregulation of post-translational modifications can result in aberrant gene expression, which causes oncogenesis and cancer progression. Abbreviations: BRD: bromodomains, DNMT: DNA methyltransferases, DUB: deubiquitinating enzymes, HAT: histone acetyltransferases, HDAC: histone deacetylases, KDM: histone demethylases, KMT/PRMT: lysine methyltransferases/protein arginine methyltransferases. Epigenetics can be defined as acquired changes in chromatin structure that arise independently of a change in the underlying DNA nucleotide sequence. 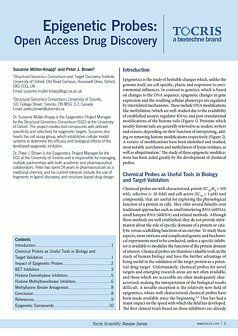 Epigenetic modifications such as acetylation, methylation and ubiquitination amongst others, can alter the accessibility of DNA to transcription machinery and therefore influence gene expression. The dysregulation of these epigenetic modifications has been shown to result in oncogenesis and cancer progression. For example, the cell cycle, as well as proliferation and metastasis can be regulated by histone modification, DNA methylation and chromatin remodeling. Unlike genetic mutations, epigenetic alterations are reversible and thus make a promising therapeutic target. Proteins that carry out these epigenetic modifications can be thought of as being either "writers", "readers" or "erasers". Epigenetic writers catalyze the addition of epigenetic marks onto either histone tails or the DNA itself. Epigenetic reader domains are effector proteins that recognize and are recruited to specific epigenetic marks. "Writer" and "eraser" enzymes may also contain such reader domains, leading to the coordination of "read write" or "read-erase" mechanisms. Epigenetic erasers remove epigenetic marks to alter gene expression. One of the most studied post-translational histone modifications is methylation. Histone methylation is carried out by histone methyltransferases (HMT), which are subdivided according to their target residue: those that methylate the arginine histone tail are known as protein arginine methyltransferases (PRMT), and those that methylate the lysine histone tail are known as lysine methyltransferases (KMT). PRMTs and KMTs regulate both transcriptional activation and repression, as well as DNA repair. Histone demethylases (HDMs) catalyze the removal of methyl groups from histones and are involved in transcriptional regulation and DNA repair. 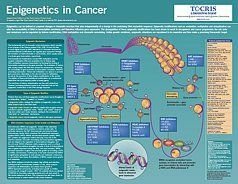 Recent studies have highlighted that alterations in DNA methylation profiles, in particular in regulatory regions - termed "super enhancer" regions, are responsible for transcriptional silencing or over-activation of tumor suppressors and oncogenes respectively. Dysregulation of the KMT, enhancer of zeste homolog 2 (EZH2) is associated with tumor aggressiveness and is upregulated in breast and prostate cancer, as well as lymphoma and glioblastomas. Other HMTs under investigation as cancer targets include DOT1L and SET domain containing (lysine methyltransferase) 7 (SETD7). Recent studies have found that aberrant methylation by DOT1L is a fundamental step in the development of MLL-rearranged leukemia, and preclinical studies have shown that the inhibition of this enzyme increases survival in a mouse model of leukemia. The methyltransferases G9a and GLP are involved in the dimethylation and consequent inactivation of the tumor suppressor p53. Histone acetylation occurs on lysine residues and is predominantly associated with transcriptional activation. Acetylation increases transcription by neutralizing the histone's positive charge, making the attraction between the negatively charged DNA weaker and thus exposing gene promoters on the DNA for transcription. Chromatin conformation is regulated by histone acetyltransferases (HATs) and histone deacetylases (HDACs), which catalyze the addition and removal of acetyl groups, respectively. p300 and CBP are two proteins with intrinsic HAT activity; they also act as transcriptional co-factors for many proteins associated with cancer, including the oncoprotein Jun and the tumor suppressor protein p53. Furthermore, studies have found that 51% of cancer cell lines tested have a mutation at the p300 locus and 35% show a mutation at the CBP locus. Bromodomains (BRDs) are epigenetic "readers" that selectively recognize acetylated lysine residues on histone protein tails. Of particular interest is the BET (bromodomain and extra-terminal) bromodomain family, which comprises the ubiquitously expressed proteins BRD2, BRD3, BRD4; and the testis-specific protein, BRDT. 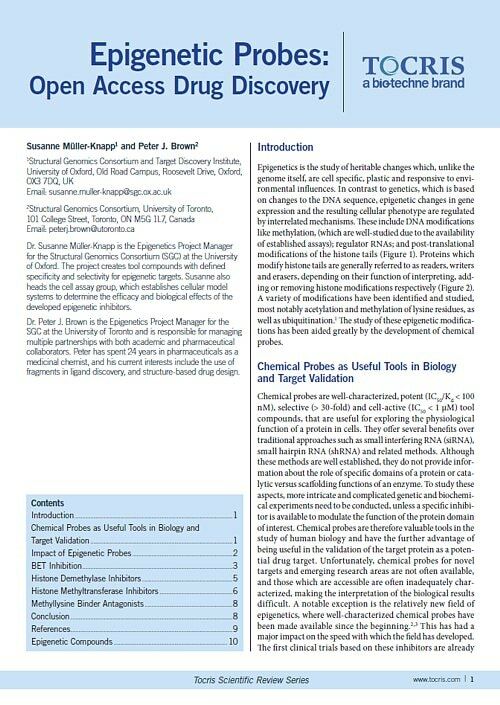 BET proteins play a key role at the interface between chromatin remodeling and transcriptional regulation, and are integral in the regulation of transcriptional elongation and the cell cycle. Inhibition of BET downregulates Myc in many malignant hematopoietic cell lines and exhibits therapeutic effects in mouse models of myeloid leukemia. BRD4 influences mitotic progression and is a critical mediator of transcriptional elongation because it binds to transcriptional sites of genes expressed during the M/G1 cell cycle transition. In vivo studies have shown that inhibition of BRD4 impairs tumor growth and metastasis. Compared to other histone modifications, the functions of histone ubiquitination are less well understood. However increasing evidence points to an important role for this epigenetic modification in the DNA damage response. One ubiquitin E3 ligase currently under investigation is Skp2, which promotes ubiquitination and degradation of p27, as well as triggering the ubiquitination of Akt. Skp2 is upregulated in many types of cancer, playing an integral role in apoptosis, cell cycle control, cancer progression and metastasis. DNA methyltransferases (DNMTs) are a family of enzymes that catalyze the transfer of a methyl group from S-adenosyl methionine (SAM) to the target DNA. DNA methylation usually occurs on the 5' position of the cytosine (5mC) ring within CpG dinucleotides. Both widespread DNA hypomethylation and hypermethylation have been observed at CpG islands and short CpG-rich DNA regions in gene promoters, and are thought to promote tumorigenesis. 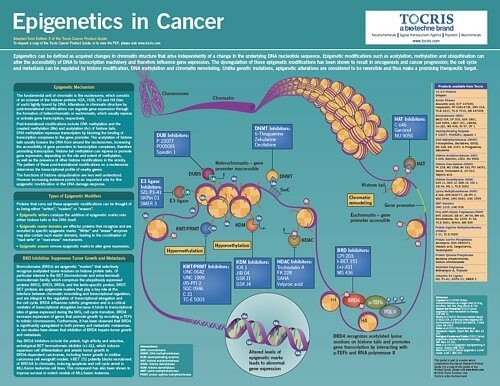 Tocris offers the following scientific literature for Epigenetics in Cancer to showcase our products. We invite you to request* or download your copy today!